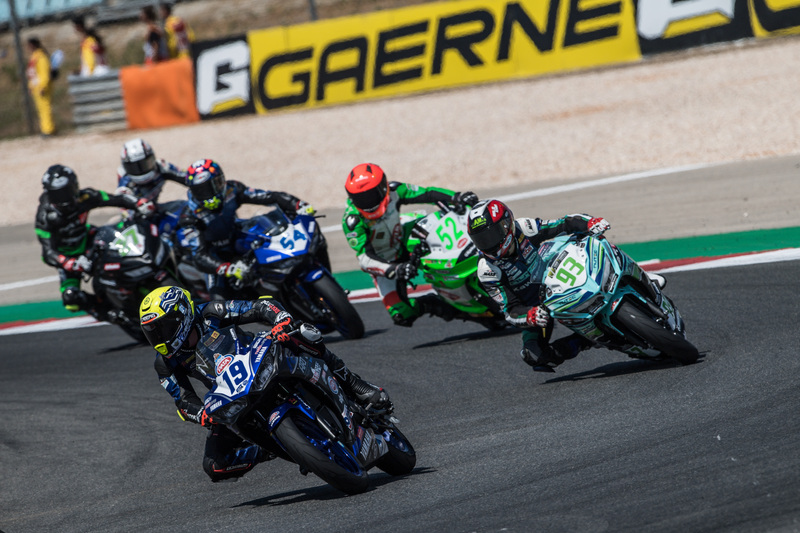 Round 7 of the FIM World Supersport 300 Championship at the Autodromo Internacional do Algarve in Portimão proved a challenging one for the bLU cRU riders. All four riders struggled to find a set up to match the characteristics of the technical and demanding Portimão track during free practice, but Galang Hendra Pratama made a significant step forward ahead of Superpole to qualify in 15th position. It was an eventful race on Sunday, as Hugo de Cancellis took the honours as the first bLu cRU rider home in 22nd place, with Dennis Koopman the only other finisher in 33rd position. Galang Hendra was forced to retire with a technical problem and Luca Bernardi crashed out of the race at turn 13 whilst challenging for points with just two laps to go. Hugo de Cancellis (Yamaha Pata | Toth – YART Team) qualified in 25th position for Sunday’s 11-lap WorldSSP300 race, which was as action-packed and frenetic as ever, with huge battles for position going on throughout the packed field. The young French rider managed to remain calm and consistent after bring forced off track on the opening lap, fighting his way from the back of the field to finish at the first bLU cRU rider home in 22nd position. Despite the best efforts of himself and his crew, Dennis Koopman (Yamaha Pata | Semakin di Depan | GRT Team) was unable to find a set on his YZF-R3 to suit the twists and turns of the 4.6km Portimao circuit during free practice. The Dutch rider eventually qualified in 36th after a difficult Superpole session, but showed great maturity to finish the race two places higher, banking a lot of valuable experience as a result. Luca Bernardi (Yamaha Pata | Trasimeno Team) was hoping to repeat his success from Misano, where he secured his best result of the season with fourth place. However, the young Italian was hampered by his qualifying position for the race in Portimão, which he started from 22nd on the eighth row of the grid. The young Italian had forced his way through the field and into the points by half race distance, but then crashed out of the race with Nick Kalinin at turn 13 with just two laps remaining. Galang Hendra Pratama (Yamaha Pata | Semakin di Depan | Biblion Motoxracing Team) also struggled to find a good set up during free practice, but the young Indonesian rider found some improvement ahead of qualifying to significantly improve on is lap time and to claim 15th position on the grid, just 0.7s off pole position. The Indonesian youngster was battling for a points scoring finish as the race drew to a close, but was forced to retire with an electrical problem just three laps from the end.